Markings: The right side of the slide is marked ”GOLD CUP / NATIONAL MATCH” and with a trophy cup. The left side of the slide is marked “SERIES ’80 COLT MK IV / GOLD CUP NATIONAL MATCH” with the rampant Colt logo. The right side of the frame is marked “COLT’S PT. F.A. MFG. CO. HARTFORD, CONN. U.S.A.” and with the serial number. The barrel is marked “-COLT 45 AUTO N.M.-“. The right side of the trigger guard is marked with “E” and the left is marked “3” and “VP” in triangle. The top of the rear sight is marked “ELLIASON”. Sights / Optics: The front sight is a blade fixed to the full-length rib on the top of the slide with the rear face painted white. The rear sight is an adjustable Elliason target sight for windage and elevation pinned to the rib. Stock Configuration & Condition: The grip is a wraparound checkered black rubber grip with silver-colored Colt medallions. The grip has some light handling wear with light verdigris at the edges of the medallions. There are no rips or tears. The grip is in about Fine overall condition. Overall Condition: This handgun retains about 91% of its metal finish. The polished surfaces have scattered light scuffs and scratches including a scratch under the slide stop from reassembly. The serrations and screw heads are sharp. The pin heads are unmarred. The markings are clear. Overall, this pistol is in about Very Good condition. Mechanics: The action functions correctly. The slide to frame fit is tight with very little play. We did not fire this firearm. As with all used firearms, it may need a thorough cleaning to meet your maintenance standards. Box, Paperwork & Accessories: This pistol comes in a blue plastic Colt box with no label with one 7-round stainless magazine and one 8-round stainless magazine. The 7-round magazine’s floorplate is marked with a rampant Colt, “COLT / 45 AUTO”, “M” and “S”, showing light operational wear, intact feed lips and a strong spring, in about Fine condition. The 8-round magazine’s floorplate is marked with a rampant colt, “COLT / 45 AUTO / 8-RD”, “C” and “S”, showing little in the way of operational wear, a few scattered spots of light discoloration from oxidation, intact feed lips and a strong spring, in Very Good-Fine condition. Our Assessment: Colt Gold Cup National Match pistols were the benchmark standard for a .45 Auto target pistol for decades. With hand-fitted parts, match grade barrels and bushings, adjustable target sights and a wider trigger adjustable for over-travel, they came from Colt’s factory with upgrades you could spend more than the price of the pistol to have done by a gunsmith on a standard 1911. The Enhanced model also has an under-cut trigger guard, allowing for a slightly higher grip. This one has light wear consistent with infrequent use and long-term storage. The lucky winner will likely have a pistol just as accurate as when this pistol first left the factory. Please see our photos and good luck! CA Legal or CA Private Party Transferable: This C&R eligible (Curio or Relic List ATF P 5300.11 Page 7) handgun CAN be transferred as a dealer sale in California. 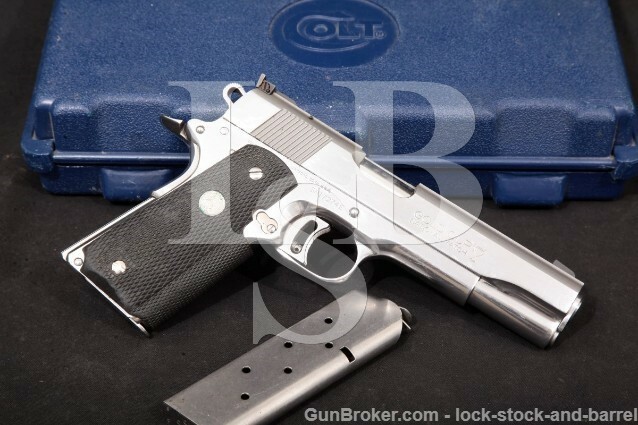 This handgun CANNOT be sold as a Private Party Transfer (PPT) at our Simi Valley shop. All cartridge firing handguns (even C&R’s and antiques) sold to a California resident must be DROS’d. This does not apply to out of state residents.